Almost there! Step 5 gets down to the nitty gritty: specifying the field types, their value(s) and the how much space should be allocated in the database for each field. The page should look something like the screenshot to the right. Once the page has fully loaded, click the "Smart Fill" button. From a coding standpoint, this is quite a complicated page and there are numerous things that could go wrong. 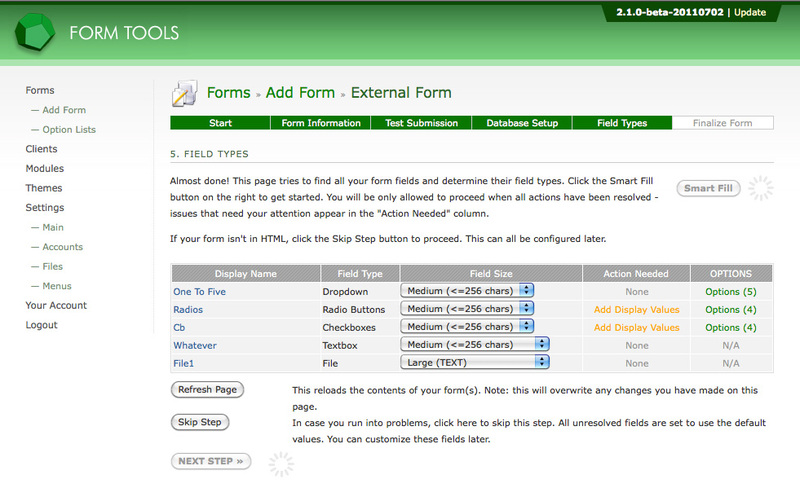 For instance, if your webpage contains errors or is malformed, the Smart Fill option may not be able to run properly. Because of this, there are various safeguards in place so recommend courses of action. 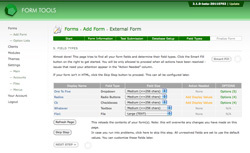 One such option is that if one or more of your form fields cannot be found, the page will provide you with the option of manually uploading copies of your form for it to be parsed directly. But for whatever reason, in case you cannot complete the page, you can always click the "Skip Step" button to bypass the page. 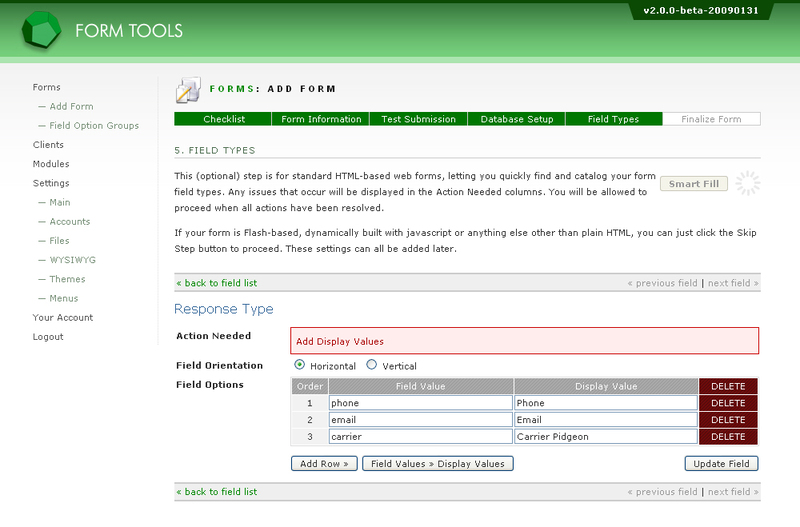 You can always edit the form later to customize the fields then. Because of this, the Smart Fill feature doesn't pre-fill the display texts for checkboxes or radio buttons, since it doesn't know where to find them! Dropdowns always have their labels found in the same place, so they CAN be pre-filled. The field size column specifies how much storage should be allocated for each field. Always make sure there's enough space! If you don't the form submission data will be truncated when it first gets added to the database! The list of available field sizes is different, depending on the field type. For some field types (like textareas) it would make sense to be able to allocated only 5 or 20 characters, whereas other field types (like textboxes) it would. There are two new sizes: 1 char and 2 chars. These are included because sometimes you only need that much space.